The Bath – Glass Half Full with Leslie Krongold, Ed.D. A bath can be healing for sore muscles, a night-time transition to sleep, and a spiritual experience. It’s one of my treatment modalities. 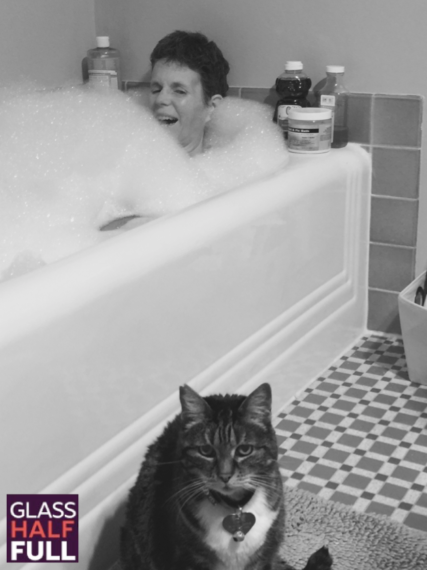 My friend, Barbara, shares her thoughts on bathing for her chronic fatigue syndrome and fibromyalgia. If you’d like to explore some bathing accouterments, check out this book, Spiritual Bathing: Healing Rituals from Around the World. Also, this is my favorite bubble bath. Here’s more information about my personal Hierarchy of Needs.